This will be the last blog post from Europe. I have to be up at 3:00 AM tomorrow for my long journey back, and with any luck, I’ll find the strength to write tomorrow night from my own kitchen. With getting ready to leave for Europe directly after Denver Comic Con, I didn’t get enough time to properly reflect on the con. 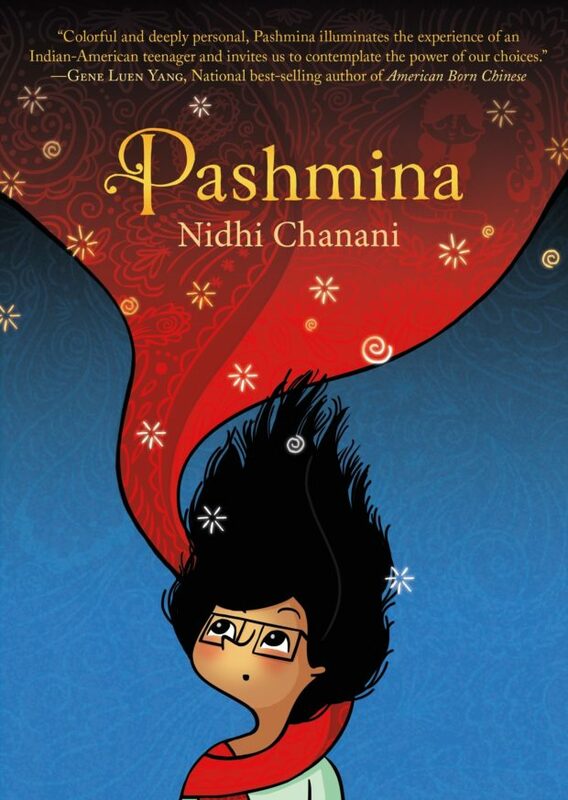 So today, I bring you an amazing book that I picked up from a creator that I had the privilege of presenting with at Denver Comic Con: Pashmina by Nidhi Chanani. Diversity in comics has for sure expanded over the past few years, but one of the voices that still seem to be underrepresented in the American comics market is the voice from India. Nidhi Chanani’s, Pashmina, is a voice proudly representing Indian culture. Chanani tells the story of Priyanka Das, a teenage girl of Indian decent, living in American with her mother that fled India from something or someone that she refuses to discuss with Pri. Pri finds a magical shall (a pashmina) in one of her mother’s suitcases, and the quest to discover her family’s past is in full motion. Beautifully constructed in shades of blue-gray with splashes of color when the shall is worn, Chanani allows the shall to become one of the characters in the graphic novel, casting intrigue and suspense onto the reader. I learned much about the Indian culture through this book, and as I end my two-week tour of Europe, I understand more than ever the importance of cultural awareness. Yes, where I live, Chicago, is one of the most culturally diverse cities in America, but we are all still Chicagoans above all else. Heck, most people in Chicago think Cinco De Mayo is Mexican independence day, and we live among thousands of people of Mexican heritage! I promise to become more culturally diverse over the course of my life. And this summer has taught me the importance of making sure that I do my best to bring a cultural awareness to my students as well.